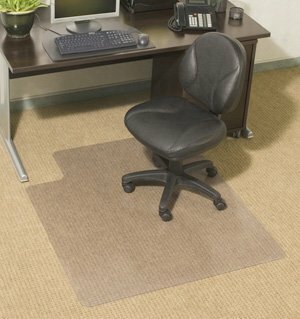 Chair Mats 46" x 60" with Lip for Carpeted Floors - Premium Thickness 1/5"
This deluxe, crystal color desk chair mat won't chip or curl and is non-flammable. Hundreds of molded spikes on the backside help to hold the mat on virtually any surface including cut-pile and loop carpet. *LIFETIME WARRANTY on all chair mats against cracks due to normal wear and tear. Chair mats available in 4 thicknesses - Economy, Regular, Standard, Premium. Custom chair mat shapes and sizes available. Please call for more information. NOTE: A "lip" is defined as a protrusion or extension from the edge of the mat. The lip protects the floor under the desk where the chair may roll if scooted all the way in. The picture to the left has a lip. NOTE: Chair Mats with a lip are listed using the overall size of the mat including the lip; thus, the rectangular portion of the mat is smaller than the corresponding size listed. Specifically designed for Carpeted Surfaces. If you have any questions about this product by American Floor Mats - Chair Mats, contact us by completing and submitting the form below. If you are looking for a specif part number, please include it with your message. Chair Mats 48" x 96" without Lip for Carpeted Floors - Standard Thickness 1/7"
Chair Mats 45" x 53" with Lip for Carpeted Floors - Premium Thickness 1/5"